Misunderstandings over key positions seriously hinder further rapprochement between Russia and the European Union. Relations between Russia and the European Union are increasingly looking like relations between two spouses on the verge of a dramatic divorce. Both sides remember perfectly all the offences they have had to suffer — and each side is totally convinced of his own innocence and moral high ground. As in any divorce, economic demarches remain the key tools for applying pressure. “We are looking at a Russia that is extraordinarily independent economically. Yes, Vladimir Putin has admitted that Russia is part of the global economy. But at the same time, Russia has entirely repudiated the view of its relations with Europe that it held back in the 1990s or even the 2000s. Russia used to say: ‘Yes, we are moving in your direction, just give us some more time'. Today Russia is saying: ‘We see no reason why we should consider your model to be correct'. Europe is in bad shape right now, and the European model is far from the only example to follow". However, the European Union hasn’t missed the chance to one-up Russia either. “We don’t see a strong Russia; we see a weak Russia. Over the past few years, 1.5 million young people have left Russia, and $100 billion in capital has fled the country this year alone. This happened because capital sees no perspective", said Bundestag deputy Andreas Schockenhoff, the German federal government’s point man on relations with Russia. 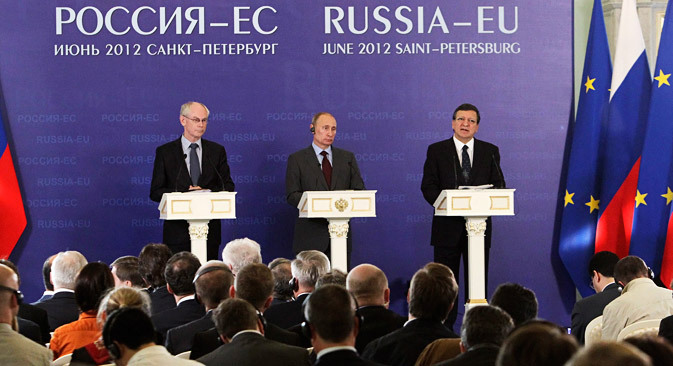 Today, Russia and the European Union are unable to agree even on which one of them is economically stronger. It’s no surprise then that the future of the key area of the Russia–EU cooperation — the energy partnership — is causing heated debates. “The third energy package is a harmful document in our view", Russian President Vladimir Putin told German Chancellor Angela Merkel when the two met in Moscow in late November. Russian authorities are seriously worried about a potential weakening of positions of Russia’s chief energy company, Gazprom. The European Union’s third energy package, adopted in 2009, mandates a separation of production capacity from transport networks, effectively dashing Gazprom’s hopes of gaining access to end consumers in Europe. Despite the fact that the construction of the Nord Stream pipeline, co-owned by Gazprom, E.On Ruhrgas, Wintershall, GDF Suez and Gasunie, was successfully completed this fall, the role of Russia’s natural gas supplies to Europe remains a moot point. The growth of Russia’s energy clout in Europe continues to stir an emotional response from European politicians, in particular from Poland, the Czech Republic and other East European nations. While Russian politicians firmly believe that Russia’s natural gas supplies to the European Union can only improve its relations with the EU, European politicians traditionally perceive the rising volumes of Russian energy supplies as a threat to Europe’s freedom to choose its energy partners. The Russian partners view this attitude not only as a humiliating lack of trust, but also as a threat to existing Russian investments, which pushes them towards genuinely aggressive steps in a bid to secure markets, above all in those Balkan countries that are not yet part of the European Union. In turn, German politicians like to stress that they prefer to deal not with Russia’s largest companies, but with its small and medium-sized businesses. “Yes, we hope for economic ties with Russia and for its integration in the West after its accession to the WTO. But economic ties with Russia should not be limited to the five largest companies", said Schockenhoff. There is mistrust between Russia and the European Union in other spheres, too — especially over the issue of visa reform. Visas are still required for travel between the EU and Russia, even for short-term tourist trips, and many EU countries require Russian citizens to apply in person at a consulate, even if the nearest consulate is still thousands of kilometres from where they live. Not to be outdone, the Russian authorities have recently started requesting proof of funds from EU citizens, such as income verification, bank statements or real estate deeds, before issuing a visa. At a meeting in Berlin with members of the German Foreign Press Association this spring, Vladimir Grinin, Russia’s ambassador to Germany, stated that Russia was ready to meet the conditions for lifting visas by November 2012. “After that, all conditions will be met, and we expect to begin the process of abolishing the visa regime with the European Union,” Grinin told journalists. In October, however, EU officials said that there were difficulties on the path to eliminating the visa regime. The main problem was Russian service passports. More than 100,000 people hold Russian service passports, including embassy technical staff, employees of state-owned corporations and a number of officials. The European Union agrees that visas for holders of such passports could in theory be eliminated, but for this to happen, the number of holders must be substantially reduced. Russia’s Foreign Ministry responded by threatening to cancel visa-free admission for airline crews, potentially locking European crews arriving in Russia within the confines of airports — a step that triggered an even colder reaction from the European Union. The matter of eliminating visas has thus returned to its original state of mutual threats and misunderstanding. Unfortunately for Russia-EU relations, the gap between the positions of both sides is widening, not only in the area of bilateral contacts, but also in their assessments of external conflicts. The conflict in Syria is another issue that has long been a thorn in the side of these relations. While Russia’s position is to recognize the legitimacy of President Bashar al-Assad’s regime and to insist on resolving the conflict through negotiations with the existing government there, the European approach lends at least moral support to the opposition. Leading EU countries have repeatedly expressed harsh condemnation of the Syrian president’s actions, and in early November French President Francois Hollande didn’t rule out the possibility of supplying arms to the Syrian opposition. In August, German parliamentary deputies launched an inquiry into whether their country’s BND intelligence service was sharing intelligence with Syrian rebels. Russia believes that such actions by the European Union undermine the fundamentals of world order and cannot be justified by humanitarian considerations — a position unlikely to resonate with European government offices. Under the circumstances, European experts, increasingly sceptical of the dialogue with the Russian administration, are ready to focus on promoting a dialogue with the Russian public. “We should not be talking to the Kremlin only. The Kremlin elite is a very isolated group preoccupied with their power and money. Instead, we should intensify the dialogue with the civil society", said Ingo Mannteufel, head of Deutsche Welle’s Russian Service and an expert on Russia. But, Mannteufel added: “We, as Europeans, have lost the trust of Russians. We haven’t expressed empathy with their interests even once over the past 20 years. We have to learn to talk to Russians again”. Franz Thönnes, a Bundestag deputy and a member of its Committee on Foreign Affairs, agress with this position. “I hope the relations are not at a dead end. The visible heated discussion of the past few weeks is just emotional foam of the relations', Thönnes said. "Under the foam, we see solid fundamentals: two million people in Russia are studying the German language; 6,300 German companies are working and investing in Russia; more than 10,000 Russian students are studying in Germany. This is the potential for our relations. We must engage in discussions – but on an equal basis, without losing sight of the big picture".